Tampa Bay, FLA (September 12, 2017) – Bay Harbor Hotel is elevating the fun for Family Night. Every Thursday, kids can now enjoy a free meal and a movie with the purchase of an adult entree. The restaurant features a donut and ice cream bar, jumbo chess, live music, and a cinema-style section for the children to enjoy popular movies such as The Secret Life of Pets, SING!, and The Lego Batman Movie. Each Thursday, Beach Bar | Restaurant sets up a full ice cream and donut buffet for kids to indulge in after dinner. The Kid’s Menu features kids’ favorites including Chicken Tenders, Grilled Cheese, Chicken Tacos, burgers, and more. Families can choose to sit either inside or outside on the cabanas by the bay. There is plenty of fun to have including jumbo chess, giant connect four, live music, sand volleyball, wave runner rentals, arcade games, and a reserved space for family friendly movies. 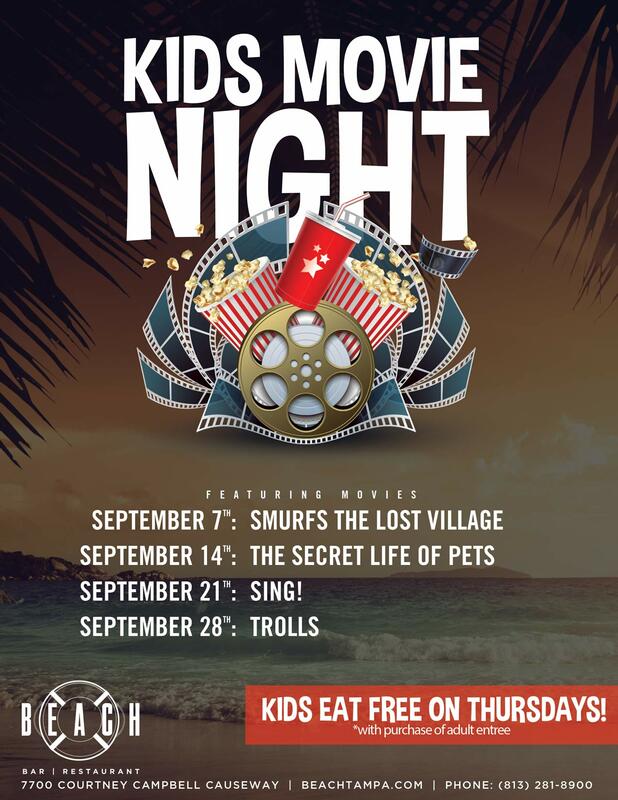 For the month of September, kids can watch Smurfs The Lost Village, The Secret Life of Pets, SING!, and Trolls. “We love kids here at Beach and want to provide a fun and entertaining space for parents and their children. Our Family Night Thursdays give families the chance to eat out, play games, and watch movies without breaking the bank”, says Chris Martin, Food & Beverage Manager at Beach Bar | Restaurant. Thursday, September 21st, 6:30 PM – SING!